Here are the real drivers behind Facebook's growth to a $200 billion company. While about half of the Internet-connected world may log on to Mark Zuckerberg's social network in an average month, many of Facebook's (NASDAQ:FB) 1.35 billion monthly active users, or MAUs, know very little about the performance of the underlying business. The success the social network has seen since it went public in May 2012 is simply astounding -- and quite interesting. In fact Facebook's stock has nearly doubled since day one on the stock market, reflecting the social network's wild success in monetizing its platform. 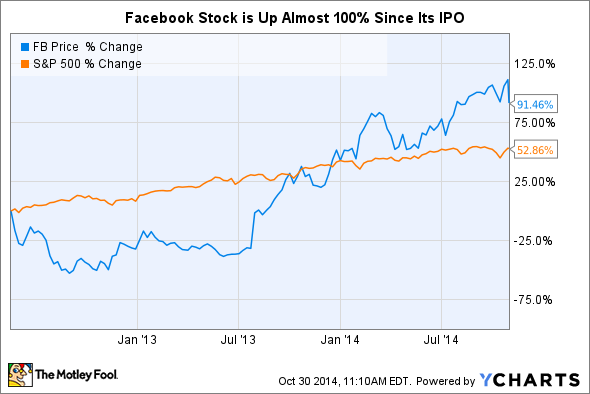 Here are the key drivers to Facebook's extraordinary growth. The number one driver for Facebook since the company went public has been its transition to mobile. For the first year of trading on the NASDAQ, investors were concerned with whether or not the social network could actually monetize its platform on mobile. Considering that Facebook users were increasingly using the service on their mobile devices, this was a major concern. But the worry lost merit when the company proved that it could not only succeed with a mobile advertising business model, but also mange to use the transition as a catalyst for accelerating revenue growth. Data retrieved for chart from Facebook's quarterly SEC filings for quarters shown. Chart source: Author. Mobile ads turned out to be both more effective and more engaging than those on desktop. The transition, paired with Facebook's moves to introduce a suite of effective mobile advertising products, unquestionably served as the most important driver in the social network's growth in recent years. With occasional stories of Facebook falling out of favor with teens and the recent buzz about the ad-free network Ello as an alternative to Zuckerberg's platform, some people may mistakenly conclude that users are declining -- or are at least less active -- on Facebook. But this isn't the case at all. Facebook's monthly active users and daily active users hit an all-time high in the company's most recent quarter. Even more impressive, the sequential growth in Facebook's daily active users actually accelerated in Q3, from a rate of 3.4% in Q2 to 4.2%. Year over year, daily active users were up a whopping 19%. Facebook's engagement is also at an all-time high. Engagement is measured by the percentage of Facebook's total monthly active users that are using the service on a daily basis. Engagement in Q3 was 64%, up from 61% this time last year. Thanks to a scalable business model, Facebook has been able to grow its earnings at a pace faster than it's growing its revenue. This trend should continue for at least the next several years. The easiest way to find evidence of a scalable business is to see if operating profit growth consistently outpaces revenue growth. Facebook's non-GAAP operating profit growth has meaningfully outpaced revenue growth for six quarters in a row. The scalability in Facebook's business has come from two key areas: the excellent economics of digital advertising and growing pricing power with advertisers as Facebook's reach and advertising products improve. Point is, Facebook may be free for users to log into, but it's quickly becoming one of the market's biggest cash cows. Revenue, margins, and profits are soaring and user count and activity on the platform is still growing. The company's market capitalization is now nearly $200 billion.